Rare art deco plan of Edinburgh, Scotland. 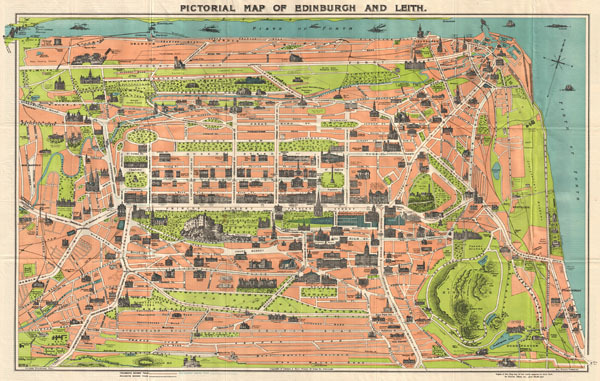 Pictorial Map of Edinburgh and Leith. This is an unusual art deco style plan of Edinburgh, Scotland by George A. Reid. Covers the whole of Edinburgh with important monuments and buildings represented in profile. Names various streets, parks, and business as well as railways, ferries, and trolleys. This is the 'Clarinda Edition' of Reid's map, referring to the 'Story of Clarinda' which appears on the verso along with a biography of Mary Queen of Scots. Clarinda was an Edinburgh native who had a clandestine affair with Robert Burns, inspiring, some say, much of his best work. Pictorial maps like more commonly represent major centers like Paris and London. This is the only such example I have come across focusing on Edinburgh. George A. Reid (fl. c. 1900 - 1940) was a Scottish printer and bookseller active in Edinburgh during the first half of the 20th century. Reid published an Edinburgh directory as well as a number of Masonic titles, suggesting an affiliation with the Scottish Rite. Reid maintained his offices at 53 Elder St., Edinburgh. Very good condition. Original fold lines. Text on verso. National Library of Australia, MAP G5774.E3A5 [19--? ].